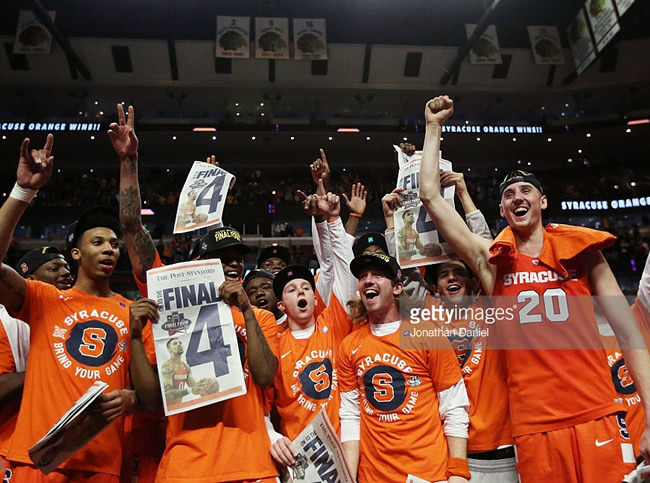 The Salt City Report: Cuse Hoops Shocks The World! Final Four Bound! Thats right, everyone! You’re not seeing things! The artist formerly known as Big League Clu is back in the flesh! Since my hiatus from posting, I’ve decided to go back to my roots and talk about the thing I love most, which is college sports. For those who do not follow college basketball, or who have simply been living under a rock for the past couple of weeks, college basketball’s NCAA tournament is wrapping up this weekend, with the Final Four at NGR Stadium in Houston, TX. My hometown team, the Syracuse Orange, made an unbelievable run through the NCAA tournament to earn a spot in the Final Four. Let’s take a look back! For starters, this year’s representatives are the Villanova Wildcats (#2 seed, South region champion), the Oklahoma Sooners (#2 seed, West region champion), the North Carolina Tarheels (#1 seed, East region champion) and the aforementioned #10 seeded Syracuse Orange (Midwest region champion). Wait, Syracuse made the tournament?…How? It should be noted that the Orange had quite an improbable run to get where they are today. This season was marred in controversy. The team coming off a self-imposed postseason ban due to a NCAA investigation that found a history of improper benefits and academic misconduct at the university. Cuse even lost Jim Boeheim to a 9-game suspension during the season. During that time, the famed head coach was banned from contacting anyone on the coaching staff, or talking to any of his players. To be quite frank, the team did not even play that great this year. When Selection Sunday came around, many experts felt Syracuse was on the outside looking in. They had lost 5 of their last 6 games, finished the year with a 19-13 record, gone 9-9 in the ACC conference (good for 9th place) and, lastly, they were eliminated in the 1st round of the ACC tournament. A lot of people felt they were destined for a spot in the meaningless NIT tournament. Yet, somehow, the basketball gods granted the Orange a glimmer of hope, and they were selected for a spot in the tournament! People flocked to the interwebs to express their discontent. The most notable person who was not pleased with the selection was none other than CBS sports analyst Doug Gottlieb, who let it be known that he felt the Orange should not have been participating in the tournament. But oh well! Didn’t matter! Cuse was in!! When the tournament started, Syracuse was scheduled to play the #7 seeded Dayton Flyers (25-8), who had beaten Syracuse in the 2014 NCAA tournament. I won’t go too deep into it, but the Orange handled Dayton, and their next round opponents, #15 Middle Tennessee State (25-10). Notably, MTSU busted ALL the brackets when they beat favored #2 seed Michigan State. They couldn’t do the same against Cuse. Syracuse now had a date with the Sweet 16, and a matchup against a very formidable #11 seed in the Gonzaga Bulldogs (28-8). Haters still criticized Syracuse, claiming they had only made the Sweet 16 because they’d gotten a break based on the seeding in the region, and because they got a favorable matchup against Middle Tennessee instead of facing Michigan State. In what was a very close matchup against Gonzaga, Syracuse did not play their best game. The offense was not making shots, which allowed the Bulldogs to get out to an early 11-point lead. The Syracuse 2-3 zone struggled to contain two of Gonzagas premier players in Kyle Wiltjer and Domantas Zabonis. With under 3 minutes to play in the second half, and Cuse trailing 56-51, the Orange switched from their zone to a full court press defense and forced Gonzaga into making several key turnovers. After a rushed layup by Wiltjer, Syracuse squeaked out a 63-60 win and advanced to their third Elite 8 in the last 5 years. Unfortunately, they next had to play against arguably one the best teams in the entire tournament, the #1 seeded Virginia Cavaliers (29-8), who boasted All-ACC player Malcolm Brogdon, senior Anthony Gill and junior guard London Perrantes, and was looking to getting back to the Final Four for the 1st time since 1984. From the beginning of this game, you knew who the better team was. Virginia’s style of offense pulled apart the 2-3 zone for over 30 minutes. When the Cavs built a commanding 16-point with a little under 10 minutes left to play, I felt that the Orange’s dream run was over. All I could hope for was that they might keep it competitive. Then, something crazy happened. 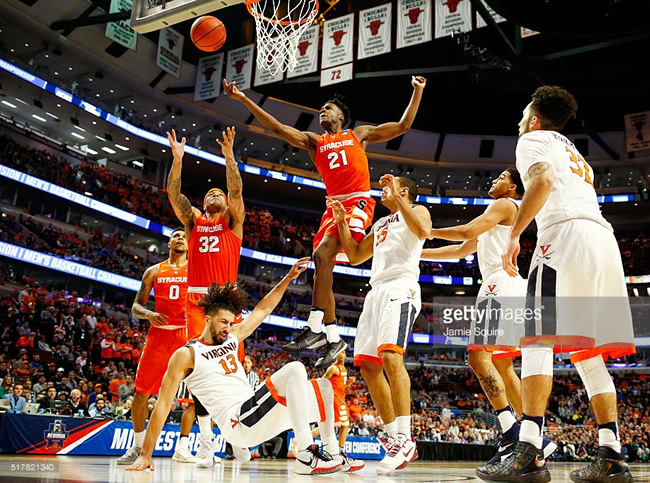 Syracuse switched back to the full court press defense that had helped them beat Gonzaga, and even though Virginia broke the press early, Syracuse started to slowly chip away at that commanding lead. They began what I can only describe as one of the greatest comebacks in NCAA tournament history. Every Virginia possession became faster and faster, and they were forced out of controlled offensive attack by the Orange. 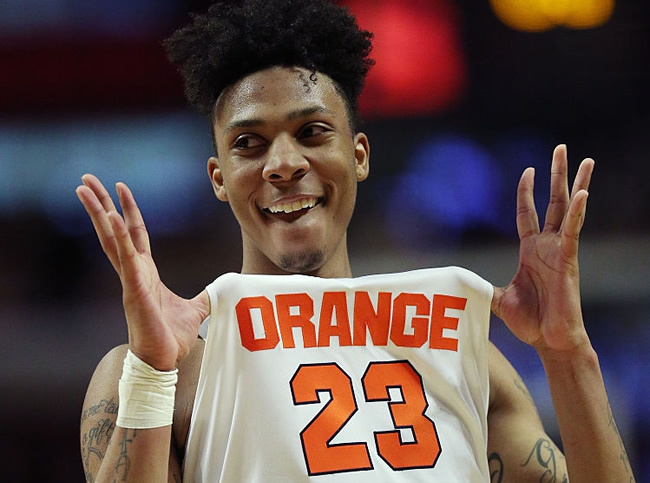 That’s when Syracuse freshman Malachi Richardson took over, scoring 21 of his 23 points and starting a 25-4 run that would end in Syracuse taking 62-58 lead with under 2 minutes to play. With the score 65-62 and only 9 seconds to go, Virginia guard Devin Hall missed a possible game-tying 3. That (finally) put the actual fork in the game, as the Orange were able to seal the deal at the foul line with free throws by Tyler Lydon and DaJuan Coleman. They had punched their tickets to the Final Four! 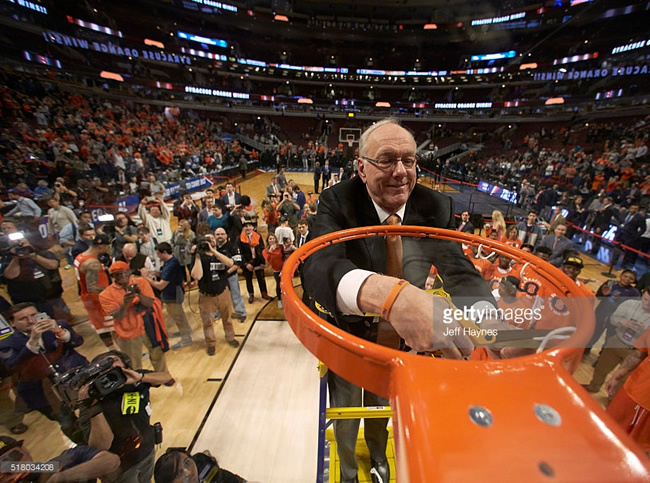 Syracuse fans took to social media and rejoiced! CUSE IS IN THE HOUSE! OMG OMG! The Cinderella story continues for the Orange for a least one more night! They are all set to take on another #1 seed, North Carolina. That is scheduled for tip off on Saturday at 8:49PM. More to come about that match up!